The Hanoi Museum on November 23 introduced for the first time four groups of Thang Long – Hanoi national treasures on the occasion of the Vietnam Cultural Heritage Day (November 23). 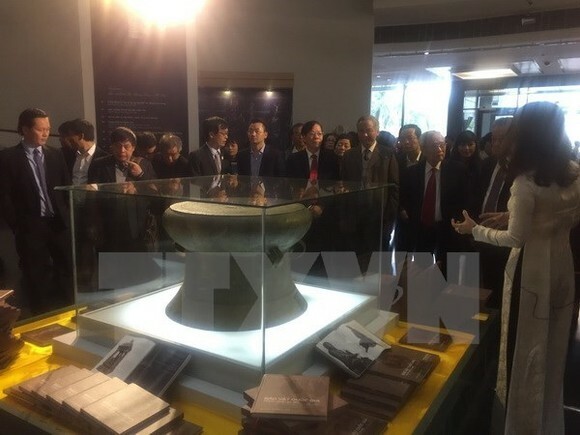 The items include a bronze drum and a set of bronze ploughshares dating back 2,000-2,500 years ago during the Dong Son Culture, which were discovered in Co Loa citadel. The Thanh Mai bell, one of the 10 Vietnam Buddhism Culture records recognised in 2006, which was cast in 1978 and found in Thanh Oai district of Hanoi, was also displayed, along with a grey blue pottery light made in the 16th century by Dang Huyen Thong, a famous artisan in the Mac dynasty, and an unique worshipping item made by artisans of Bat Trang pottery village in the 17th century. The museum also showcases a number of items simulating the remaining eight of total 12 Government-recognised national treasures in the Dong Son Culture period, which are being kept at the museum. On the occasion, the Hanoi Department of Culture, Sports and Tourism held a meeting with people with significant contributions to the conservation of Hanoi heritages. The Hanoi Museum also introduced a photo book on Thang Long-Hanoi national treasures. The same day, the Hue Monuments Conservation Centre also held a photo exhibition to mark the 100-year anniversary of An Dinh Palace, the private palace of King Khai Dinh, in the central province of Thua Thien-Hue (1917-2017). Dr. Phan Thanh Hai, Director of the centre, said that An Dinh Palace is located in 197B Phan Dinh Phung street in Hue city. It is part of the Hue monument complex, which has been recognised by the UNESCO as the World Cultural Heritage. The palace was a unique architecture of the Nguyen dynasty with a mixture of European style and traditional decoration. Under the reign of King Khai Dinh (1916-1925) and King Bao Dai (1926-1945), An Dinh Palace was used to serve royal events. After the August Revolution in 1945, the family of Bao Dai moved from the royal citadel to An Dinh Palace after he abdicated. In 1975, the palace was handed over to the government. It has been restored from 2002 with the support of Germany. The palace currently serves as a venue exhibiting items in the late Nguyen Dynasty.